Somalia’s renegade rap ensemble Waayaha Cusub offers opposition to piracy and al-Shabaab. 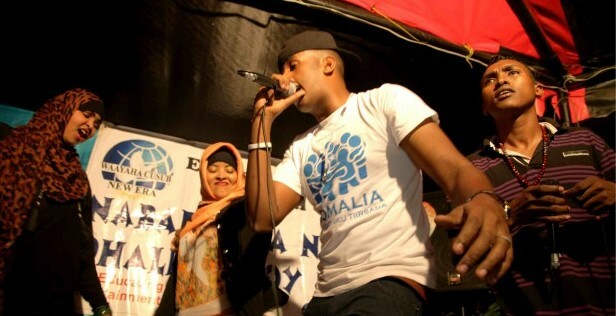 Founded in 2003, Waayaha Cusub (New Era) is a dynamic group of rap artists based in Nairobi and Mogadishu, with the various members torn apart by the war that’s waging in Somalia. Their groundbreaking album “Dadka yaa xasuqay?” (Who is killing the people?) not only brought the crew to local music channels but also sparked anger among Somalia’s warlords. Al-Shabaab agents have been sending us numerous threats for the past four years. In November 2007, they went a step further by waylaying me at the entrance to my house in Eastleigh’s Eighth Street where they shot me several times with intent of killing me. But thank God I survived, although I spent six months in hospital. Still, last year Waayaha Cusub released their album called No To Al-Shabaab, produced in collaboration with Kenyan artistes Abbas Kubaf and Ukoo Flani. Thir track “Burcad Badeed” (Piracy) features Abbas and tells a story of a young pirate’s fate which is far from romanticized images in literature but also offers the Somali perspective on the Gulf of Aden – a topic usually dominated by Eurocentric talk about securing goods traffic in the media. Marius Münstermann is based in Berlin where he works as a freelance journalist. Marius serves as editor-in-chief at eufrika.org.